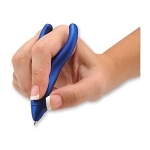 Easi-Grip Arthritis Carving Knife keeps the wrist in a natural position, preventing wrist strain. 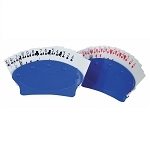 Keeps the wrist in a neutral position, preventing strain and discomfort. 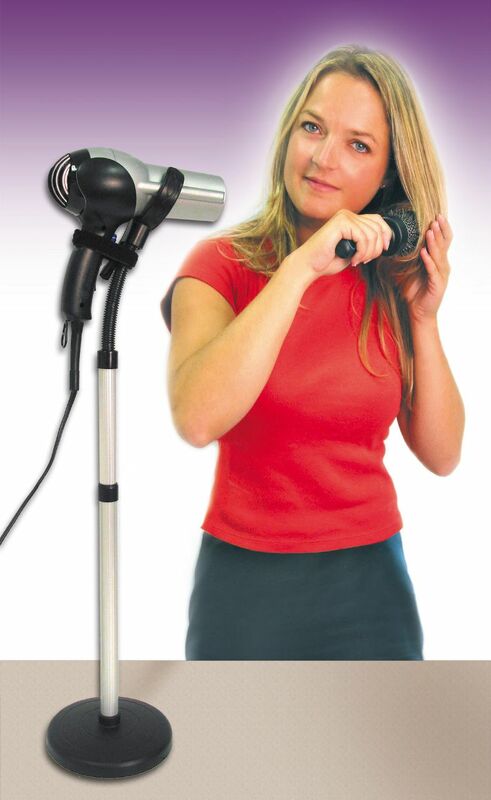 Ergonomic handle provides a firm grip in either hand and can be used safely with wet or greasy hands. 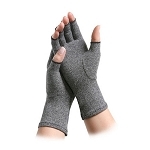 Designed especially for people with weak hands or wrists, but is comfortable for all users. 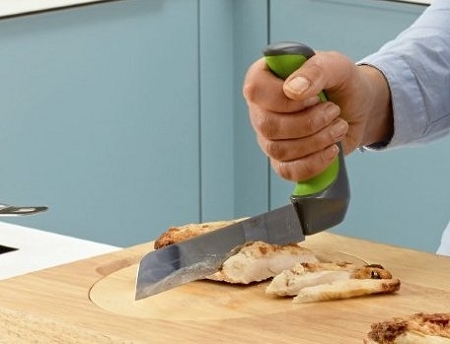 Designed especially for persons with arthritis or weak hand grip, the Easi-Grip Arthritis Carving Knife is an adapted kitchen knife with a large, upright handle that is comfortable to grip. 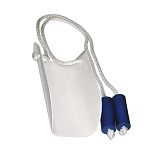 The angle of the non-slip, soft feel handle helps keep the wrist in a natural position, eliminating wrist strain, and preventing discomfort, allowing persons with weak hands to grip and use the knife effectively. The contoured handle of this lightweight carving knife is molded in a soft plastic and set at a 90 degree angle from the blade. 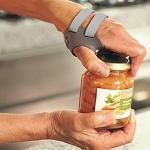 The handle was designed especially for people with weak hands or wrists, but is comfortable for all users. The ergonomic handle provides a firm grip in both the left and right hands, and can be used safely with wet or greasy hands! 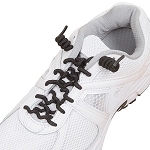 The bright color highlights the special soft-feel non-slip areas on the handle. The Easi-Grip Contoured Handle Carving Knife has stainless steel blade that measures 7.5 inches long and 1 inch wide, and includes a protective cover. The handle measures 5.25 inches long, tapers from 2 inches wide at the base to 1.5 inches wide at the top, and 1.25 inches high. Peta Easi-Grip knives are dishwasher safe. Received the knife and it was dull and not sharpened. As such it was a very poor knife to use. I have spent many minutes sharpening it and it is still not functioning properly. 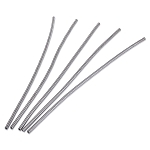 The material is identified as stainless steel. As a metallurgist, I can tell you this is a very poor quality of stainless steel and it does not sharpen easily. I would not recommend this knife to anyone. This knife has helped me so much. The arthritis in my hands and wrists make using a regular knife hard as well as dangerous. The blade sharpens easily and stays sharp. I feel I have more control over what I am cutting and it makes my life so much easier. Thank you. I am a quad amputee and now have myolectric hands. This knife has made it much easier to get back to cooking and helping out in the kitchen. I used this item for the first time yesterday making vegetable soup and found it easy to use and helpful for my arthritic hand. Glad I ordered it.! It's sturdy and sharp, and especially painless for my right thumb and wrist. this knife was perfect for John's right hand. Now he can be a part in the kitchen just a little more. Is there a smaller one for dinnertime at the dining room table? Q: How long is the blade, please? Thanks! A: The blade measures 7.5 inches long and 1 inch wide. Q: Does this knife have a serrated edge? Thanks. 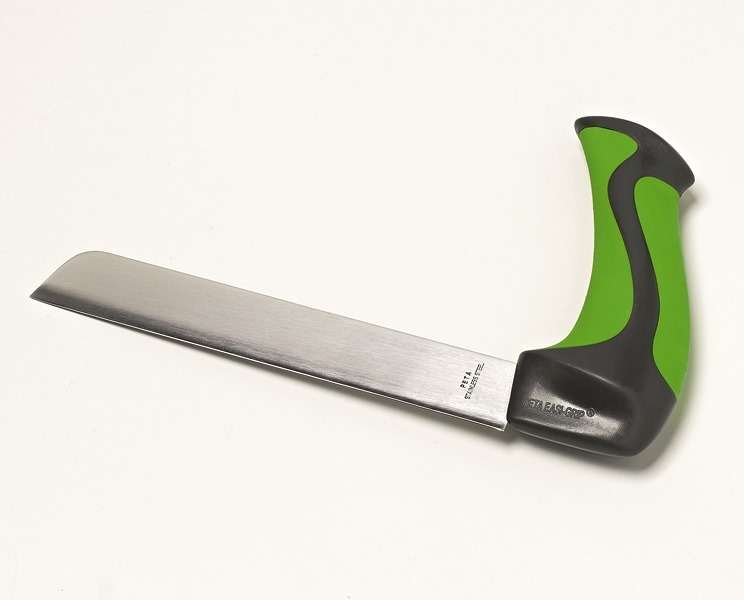 A: No, the Carving Knife does not have a serrated edge but the Easi-Grip Arthritis Bread Knife (Product #: APE102) does have a serrated blade and the Fork Knife (Product #: APE104) has a slightly serrated blade.